Some days back we mention about How to Setup Mail in iPad, How to Turn on off and reset iPad and Apple iPad Battery Saving Tips, So this time we are going to share one more tips which will help you to to Backup, Restore Apple iPad. 1. Make sure you have the latest version of iTunes installed and running before attempting to update. 2. Connect your iPad to your computer. 3. To do so, Control-click or right-click the iPad icon on the left side of the iTunes window and choose Back Up. Facing some problem with ipad and want to restore it, than here is the tutorial. Restoring your device will delete all the data from your device, including songs, videos, contacts, photos, calendar information, and any other data. All settings are restored to their factory condition. 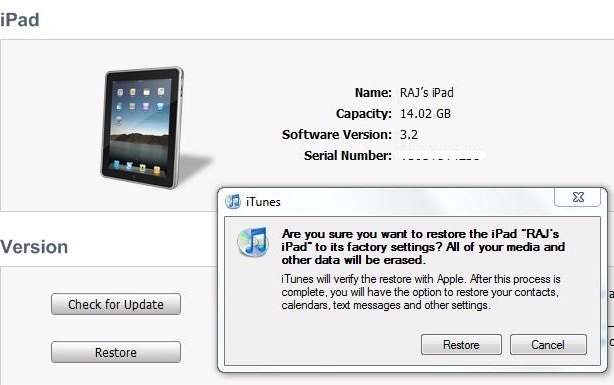 Whenever you restore your device, we recommends that you perform a Backup of your iPad first. 3. Select your iPad when it appears in iTunes under Devices. 6. 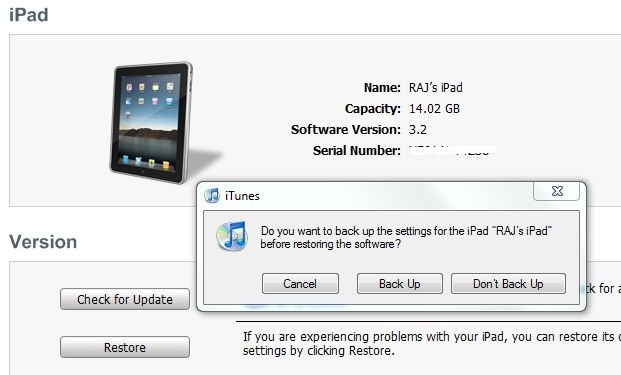 When prompted to back up your settings before restoring, select the Back Up option (as seen in the image below). If have just backed up the device, it is not necessary to create another. 7. 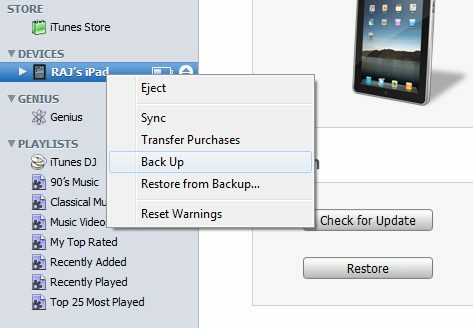 Select the Restore option when iTunes prompts you (as long as you’ve backed up your device, you should not have to worry about restoring your ipad). The final step is to restore your device from a previous backup. Do the steps that i mention above and Click restore From Backup.